So You Sent Your Werewolf, Zombie, and Leprechaun to Space. Here's What Science Has to Say About That. The last stage of any monster movie franchise is sending the monster to space. Jason, Dracula, and the Leprechaun have all been sent off of the Earth to boldly slash where no one has slashed before. Sure, they can do that in the movies. But what, you ask, would really happen? Today we're going to take a scientific approach to monsters in space, and see who emerges as the best astronaut - and the most frightening menace. Jason went to space in Jason X, killing teenagers from another planet, just for a change of pace. Jason is probably the most effective space villain out there because his entire deal is this – he's a murderer who can't be killed. There's no real gimmick or weakness to him, so killing people in space or on Earth doesn't make a difference. His major problem is water, which in some continuities makes him hesitant or confused. This is a problem for future astronauts, since in most space missions loose water is even more a problem for those aboard than it is for Jason. As such, Jason is probably the greatest danger to any possible space mission. On the other hand a space mission the best possible way to get rid of Jason. Send him into the sun, or twirling out into space Major-Tom-style. It has to be better than yet another sequel. 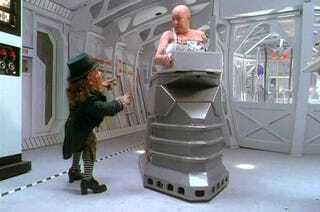 The Leprechaun went to space in the fourth movie in this, the most ridiculous of horror movie franchises. The motivation for the Leprechaun is always the same - getting back his gold. Now that there are plenty of computer and scientific instruments that use gold, he might prove a significant danger, since it wouldn't do to have him ripping out the wiring of a shuttle. He's also got the physical qualifications for space travel. He's small, so he can fit anywhere, and he doesn't seem to need food or water. If any gold is intact, though, it might be the easiest way to get rid of him. Jettison the gold in space, and he goes after it. But do you want him to be gone? The Leprechaun is one of the few monsters that might prove invaluable to the crew. In the movie it's shown that he will literally stop everything to shine and repair shoes, and a lot of leprechaun myths give them an OCD for cleaning things or putting them in order. A good part of space travel is making sure everything is squared away to keep it from getting in people's faces or in the instruments. Because microgravity causes things to float and splatter, this isn't easy. One astronaut complained that on the International Space Station they lost an entire container of "sharps" - needles, razors, and any other sharp object that was put in the container for disposal. The Leprechaun, in this context, could be a free clean-up crew who will never get around to killing anyone. Dracula himself went to space in that masterpiece of film Dracula 3000. No doubt you covered the finer points in your film classes, or caught it at a local art house theater. It's funny but, in near-Earth space travel, vampires have to be the most ineffective monster ever. Sure, films like the Dracula series and 30 Days of Night can make them look like fearsome antagonists, but that's only because we have to share a planet with them, and on that planet it is night about half the time. Once you get off the planet, what's called "night" is actually just "shade." As in, a tiny patch of shade from the massive ball of solar radiation that can reach anywhere in our solar system. As soon as you are out of the shade of one rinky-dink planet, the entire solar system is your vampire slayer. Granted, most spacecraft don't have a lot of windows, but who knows? Maybe magnetosphere around the Earth, which blocks a lot of solar radiation, is the only thing keeping vampires alive. In that case they'd go sploof as soon as the craft got in orbit. But let's say that Dracula pulled a … Dracula, and stowed away in well-protected containers on a ship that was heading to an exoplanet. Possibly the sun there would do as much damage as the sun on Earth, but then again maybe not. If vampires did make it to an exoplanet, maybe they could live forever, walking in the light of an alien sun. Don't know what they would eat, though. An upcoming movie, Steel Moon, sends werewolves to space on the premise that, in space, it's always a full moon. Not quite. The side of the moon that faces the sun is always fully illuminated – except when there's a lunar eclipse. But the side of the moon that faces away from the sun is always dark. Since werewolves don't pop in and out of their wolfy state when the moons are full on other planets, we know that only the Earth's moon affects them. Therefore, at any one time the universe is going to be divided into two even halves - the half that's on the bright side of the Earth's moon, and the half that's on the dark side. These halves will shift as the moon and Earth orbit around the sun, but they could still be useful. In the future, the werewolves, or werewolf tissue samples, could become beacons. Station spacecraft with either werewolves or werewolf blood samples and robots capable of reading them, around the Earth. Have them beam out whether the samples are wolfy or human. Issue other samples to every ship. Any long-haul freighter that gets lost, far from Earth, might be able to use the shifting Werewolf Horizon – the line that divides the wolf and human sides of the universe, to navigate back to Earth. Zombies, man. Is there anywhere they haven't gone? There are a lot of movies that have zombies, and zombie-like creatures in space. Films as different as Solaris, Event Horizon, and Heavy Metal have creatures that could arguably be zombies, so clearly, what a zombie would do in space depends on what kind of zombie you've got. Speed of movement isn't really going to make a difference here. Ultra-fast movement, like the zombies in 28 Days Later, or just barely moving, like Dawn of the Dead, is all the same if all you're doing is klutzily flail your limbs in zero gravity. What's making a difference here is brainpower and state of decomposition. A herd of zombies might do more harm to a space crew leaking their rotting flesh into sensitive computer parts than they could ever do with their teeth. A cool use for them, if they're not decomposing and not strong or smart, is to line the walls of the spacecraft with zombies in order to absorb radiation. I think the best use for zombies in space might be for experimentation purposes, though. Are they affected by radiation? Do they get tumors? How much of the human brain remains in a zombie? For instance, will a zombie that has its lower half try to talk no matter what, while one that only has its arms claw its way along the walls, and thus be a better mover? And what does this say about the neurology involved in zombification. These questions have to be answered. No wonder so many people are dumping zombies in space.